“Every child should be in school’ This is the fundamental principle of Child Labour Free Zones. To achieve this goal though, a holistic approach is required that looks at the bigger picture as to why children in Budhpura end up working in cobble yards. That’s why the Manjari team also supports young adults to achieve vocational training. This helps them to earn a decent income, so that their younger brothers and sisters can focus on their education. Netu and Hamleta are 19 years old and both dropped out of school many years ago. 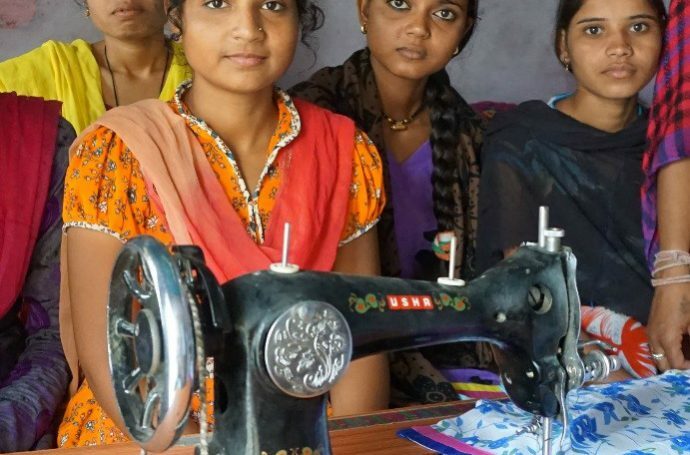 They are no longer of a school going age, but they are part of a Manjari skill building/training programme to teach young women stitching skills. 12 years ago, Netu’s family migrated from another district to Budhpura village. Shortly after reaching Budhpura, Netu’s mother died and from that moment on Netu would spend the entire day at home as a domestic worker. When Netu was first approached to attend the stitching course she was very reluctant to sign up as she was already very busy with her home and family responsibilities. After a lot of coaxing from the CLFZ team though, she realised that the training was in fact a great opportunity to increase her family’s income. She has now completed level 1 of the stitching training and with the money she made from this she was able to buy her own stitching machine. Her face lights up when she shows us the blouses and shirts that she has made. With her level of training she is now able to make clothes for the local market and she is earning good money to support her family. There are also lots more opportunities for Netu to develop her skills and her ability to earn. If Netu can achieve level 4 of the training, she can work for bigger companies in Jaipur which will further improve her skills and earning power. Hamleta’s parents came to Budhpura about 25 years ago. Hamleta attended school up until the 10th grade but because here mother worked in the Sandstone quarries she had to leave to take care of her brothers and sisters. Although Hamleta’s mother still work’s in the quarries today, after an intervention of the project team, Hamleta is now able to participate in the stitching training and while she is at the Manjari community centre, she gets chance to make use of the library as well. Netu and Hamleta are just two of the 25 girls that were identified by the Manjari project team to participate in the skill building training programme. The training also gives the girls the opportunity to share their stories with each other, build their self confidence and help them to play a more active role in society. In this way the CLFZ project contributes to the development of the the community on so many levels. Manjari is a non-governmental organization (NGO) based in Rajasthan, India. Manjari is supporting the cause of women’s and children’s development.